Two part resin based system, suitable for interior and exterior use and fully cured in 30 minutes. Can be drilled, screwed, planed and sanded then painted, stained or varnished. Use in conjunction with Wet Rot Hardener 94441 when treating damage caused by wet rot. 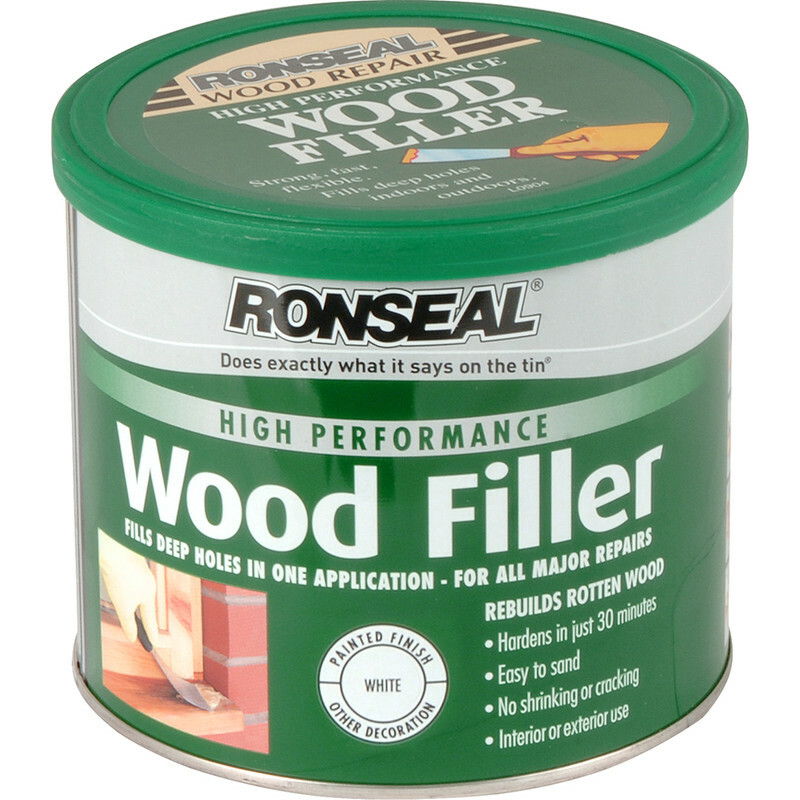 Ronseal High Performance Wood Filler White 550g is rated 4.9 out of 5 by 40. Rated 5 out of 5 by Mazz from Fabulous Two part mix is always better slot stronger bond. Easy to sand . Rated 5 out of 5 by Apollo from Excellent wood filler I'm a fan of this product having used it many times. You need to work quickly but the upside is that its ready to sand within half an hour. Sands to a really smooth finish and feathers nicely. Use the hardener sparingly as I have run out on a couple of occasions. Overall... excellent!! Rated 5 out of 5 by Rooster30 from Great filler Good wood filler to work with and sands easily. Rated 5 out of 5 by Marck from The best This is the best wood filler I have ever tried. Sands down to a very smooth finish and does not crack after time. Rated 5 out of 5 by Salty123456789 from Did the job perfectly well. The mixing instructions are quite simple - a golf ball size quantity of filler to a pea sized quantity of hardener. It seems a bit hit and miss, but worked fine. Rated 5 out of 5 by Adrian71abczc from Works a treat Filling in some holes left by rotten wood and this is perfect.